When I read stories from people who say that their GPS sent them this way, or sent them that way, or made them turn their vehicle into a corn field, I have to shake my head. Seriously? It made you turn into a cornfield? It's like they turn on their GPS, and turn off their brain. Your GPS device is made to be used as a guide, not meant to be followed blindly. I think the biggest mistake people make is to let the GPS choose your route. Sure, that can sometimes be the easiest way if you're in a car and in the city and you just want the simplest way from point A to point B. And, sometimes your GPS really will chose the best route. But if you're in a cumbersome motorhome, or pulling a trailer, you don't want to end up in a cornfield, so to speak. And that's what might happen if you allow your GPS to blindly lead you to your destination. Because we do a lot of driving in our motorhome, and some of it in Mexico where some of the village streets can be narrow, we don't want to end up on a road that's not RV friendly. So I don't trust our GPS to pick the best route. I make the route, and then enter it into the GPS. I still use Google maps even though I much preferred the old google maps to the new one. I simply haven't found a better mapping system, so until I do, Google maps is it. Using Google maps, if you "right click" anywhere on the map it will give you a menu that allows you to choose whether that point is your departure or your destination. So you first allow the map to make your route, then you look to see if there is a better route. Perhaps you don't want to take the most direct route. Perhaps you don't want to travel on the main highway. You can then alternate your route accordingly. One of the "right click" items on the menu says "What's here?". If you click that, it will give you the GPS coordinates of that point. So wherever you want to make a major turn, you want to put your cursor on that point and get the GPS coordinates so that you can input those coordinates into your GPS. Yes, often on a day's travel I will input co-ordinates four or five times as we get to our destination. As you input those coordinates, you check the map route on your GPS to make sure it's the route you want. I also use the coordinates from Google maps for anything we need to find along the way. And I use street view for looking at roads to see if that road is suitable for the motorhome. Your GPS has route planning options, such as "fastest route" or "shortest route". But again, these are guides...they are not necessarily the fastest or shortest in the real world because there are too many variables. 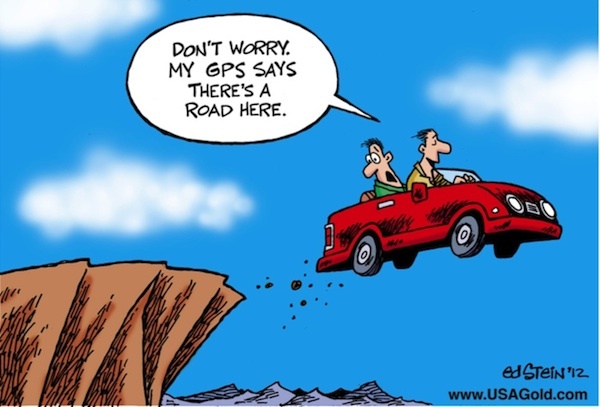 The GPS's brain is smart, but not as smart as your's! You need to use your own brain to confirm whether or not the GPS is correct, and then decide which route is better for you. And, when we hit the road, I have the GPS running, but Ruth is also tracking our progress with an actual paper map. Sometimes she'll see a possible route change that takes us somewhere worthwhile. Having a GPS is not the be all and end all of road travel, but it's certainly a device I don't want to be without. Using it smartly can save you time, money, and aggravation. But using it blindly will at some point cost you. Guess you will have something similar to this in the states but when we get our next motorhome we shall be buying a "snooper" satnav. With this you can key in the length, width and weight of your vehicle to avoid problem area and it has a much bigger screen which is great if you are in a motorhome and have it in the middle so you can both look at it. I'd hate to rely on one and we still use a map as well as this often helps us spot different things en route and good free camping - as you well know! Garmin has come out with a GPS in the USA specifically made for RV's. Model number 760 LMT. I've included it in the link above. That is exactly the way we have planned our trips. We plan our travels with Microsoft Streets and Trips (though it is no longer available but still is our main planning device :<() and each day I check google maps to fine tune where we want to go then Suzie can adjust it on our Street and trips with the gps or we use our smart phone as a GPS, have never found a need yet for a stand alone unit. And a paper map does come into play as well. I won't make that mistake again with the GPS where we trust it to the corn field! We definitely think that is the way to go! It saves time and money in the long run. Don' have a GPS and see no need to. We mange fine with paper maps and Google maps for detailed city driving. We do lots of driving on small back roads, some that don't even show up on paper maps (unless we go and buy a detailed map of the area) and we want to know exactly where we are going beforehand. When it is just on main roads it's not as necessary. Google maps and a GPS aren't much different really, they are still guides. I quit using paper maps about the same time I quit using pens and pencils, while driving and stopped at a rest area, bring out a paper map and you have to figure out where you are by street names, mile markers os some reference point, look at the screen on a phone or computer and instantly see where you are within a few feet. I used delorme street maps for years with a blue tooth gps before laptops had them built in but have gone to copilot for phone and that gets me where I want to go based on vehicle selection, bike or walking. Yep, we find GPS or some other electronic "guide" as being so much more helpful than paper maps. Having said that I do like to follow along with a paper map as well, it is always nice to have for a back up, plus it lets me know where we are in the big picture. I think GPS's are so much more helpful to the solo drivers out there. Folks are actually starting to "unlearn" map reading it seems. And I'm not kidding, they've done studies. I prefer an old fashioned paper map to most versions of GPS. Unless it's the built in kind we had in Austria with a map right in the console. But that was a 3000 Euro option! Kevin likes our GPS and has found a way to make it work for us, although he isn't fond of the Tom-Tom that we have at the moment. They are great in the city but again they are only as good as the latest mapping system is on them. We love having some kind of electronic "guide" whether it be a GPS unit or some sort of mapping system on a smart phone. My GPS about has a fit when I don't want to follow it. You are absolutely right in suggesting don't follow it blindly. It think they all do! ;-) We don't let it tell us where to go, Kevin tells it where to lead us. We've nicknamed our GPS "Nancy the Nag-i-vator" and as Ray and Cindy stated she throws a fit when we ignore her directions. The best case scenario is to have a paper map close at hand, and put Nancy on mute. She's great for inner city travel, but sometimes in the country she prefers to reach a designation via a corn field! I love the name! This is exactly why Kevin inputs the co-ordinates into the GPS for each and every major turn or for each destination for that day. Sometimes he will input different co-ordinates 3 or 4 times during a day depending on what and where we are going or doing. They can be very helpful but following them blindly can be a hindrance. Yep, they are definitely a great tool for city driving. I use Google Maps---especially its satellite and Street View features---for optimal RV route planning. I use the old noggin for the actual navigation. I only use a GPS (a real one) on those rare occasions I take a wrong turn in the woods. We use ours all the time but Kevin uses these other tools as well to plan the trip then input the necessary co-ordinates into the GPS. I always have a paper map as backup, plus I just love knowing where we are at all times. Maybe we're nuts, we just follow the signs. People ask us the hwy numbers we use in Mexico. I wouldn't have a clue. I just stop and ask someone. The stock answer is "todo derecho", "just keep going straight ahead".